Clogged Drain … Backed-Up or Burst Pipes ? Mr Plumber can help you with the right diagnostic equipment and the full range of drain clearing solutions. Your blockage can be cleared, from the smallest clogged sink, to an obstructed sewer line. And best of all you can benefit from the Mr Plumber standard of service, guaranteed work. If you have a broken pipe and can’t switch the water off, call immediately. 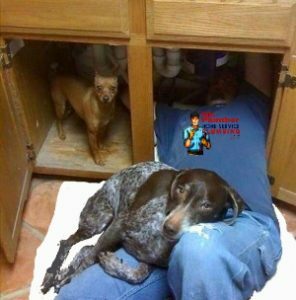 Mr Plumber always has a master plumber ready to give advice over the phone 24 hours a day. Water can do serious damage to your home and your property. And while you are on the phone, we can have a plumber dispatched and on his way to you for emergency plumbing repairs. If you’ve managed to switch the water off, or if it is only a minor leak – we can book a repair around your busy schedule at a time convenient for you, all with the Mr Plumber service guarantee. If you have a Drain Clog, Sewer Line Backup or burst pipe, don’t delay!